Dolphin+ is 14nm ideal system-on-chip for Automotive Infotainment, Cluster and Cockpit system with flexible design based on ARM Cortex™-A53 Quad or Dual core. The SoC provides great performance of 2D/3D graphic engine for rich and vivid GUI. Dolphin+ supports multi display and multi channel camera input and embodies MICOM subsystem. In addition, Telechips solution enables Dolphin+ to run automotive grade Operating Systems such as Android™ and Linux™. Dolphin is a system-on-chip for car display audio systems, providing plentiful connected car interfaces, mobile device connectivity solution, SDR(Software Defined Radio) solution and Smart Antenna. It is ideal for cost effective car display audio devices with flexible design based on ARM Cortex™-A7 Quad or Dual with good performance of 2D/3D graphic engine for rich GUI. Especially, Dolphin provides an advanced technology as automotive HSM(Hardware Security Module) and handles control of CAN bus with MICOM subsystem. In addition, Telechips solution enables Dolphin to run automotive grade Operating Systems such as Linux™ and QNX™. Dolphin delivers values of optimal processor of car audio device for OEM systems and after markets. 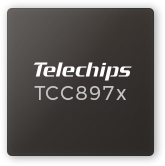 The TCC897x is a system-on-chip with powerful multimedia solution, low power consumption and optimized performance. It is ideal for cost effective multimedia devices with low power such as Smart Stick, IP-Client, OTT, IPTV, Car Display Audio, AVN and Smart Antenna. TCC897x multimedia application processor is based on Cortex™-A7 Quad or Dual and Cortex™-M4 with a multi-format hardware video accelerator including HEVC optimized to reduce power consumption, high-performance 2D/3D graphic engine for rich GUI and various peripherals to save total costs. Especially, TCC897x supports powerful security for variable STB application. The TCC893x is a system-on-chip with powerful multimedia solution and high performance such as dual decoding. It is ideal for high-end multimedia devices such as Set Top Box, Media Box, Car AVN, and Tablet PC. TCC893x multimedia application processor is based on Cortex™-A9 Dual & M3. With a multi-format hardware video accelerator optimized to reduce power consumption, high-performance 2D/3D graphic engine for rich GUI, and various peripherals to save total cost. In addition, Telechips solution enables TCC893x to run stable open operating systems such as Android™ , Linux™ and Windows® Embedded Compact 7. The TCC892x-i is a system-on-chip that include powerful multimedia solution and high performance. It is ideal for high-end multimedia devices such as tablet PC, car AVN, portable multimedia player, multimedia internet device, and home entertainment. TCC892x-i multimedia application processor is based on Cortex-A5 with multi-format hardware video accelerator optimized to reduce power consumption, high-performance 2D/3D graphic engine for rich GUI, and various peripherals to save total cost. In addition, Telechips solution enables TCC892x-i to run stable open operating systems such as Linux, WinCE and Android. Telechips' TCC880x-i application processor will redefine the mobile device of tomorrow with new' innovative user experience by PC-like web browsing, 1080p full HD video record & playback, intuitive user interfaces, location based services and next generation social networking applications. TCC880x-i supports development of planned features for the Tablet PC and STB of tomorrow with tremendous performance and programmability to support new applications yet to be imagined. TCC880x-i is equipped with hardwired VPU/GPU to maximize multimedia experience at its peak level. The TCC890x-i is a system LSI for digital multimedia applications based on ARM1176JZF-S, an ARM’s proprietary RISC CPU core. It is designed for high-end multimedia entertainment devices such as car AVN, portable multimedia player and home entertainment. The TCC890x-i supports decoding and encoding various types of video and audio standards with software and dedicated hardware codecs. In addition, TCC890x-i offers a hardwired 3D graphic accelerator to enrich next generation GUI and other graphical applications. The Heron, based on ARM®926EJ-S, is optimized processor for car audio systems with internal stacked SDRAM. The on-chip USB Host controller and other flexible features provide cost effective solution to host player applications such as car audio, home audio, etc. Telechips provides turnkey car audio solution that includes bluetooth stack, digital radio, iPod connection and rear view camera. The TCC8010-i is a Digital Multimedia Processor based on the ARM926EJ-S, ARM’s proprietary 32-bit RISC CPU core. It can decode and encode MP3 or other types of audio/video compression/decompression standards by software based architecture. The on-chip USB Host controller and other flexible features provide cost effective solutions to host player applications such as car audio, home audio, etc. The TCC8001-i / TCC8002-i / TCC8003-i optimized for CD / MP3 are system LSIs for digital multimedia applications based on ARM926EJ-S core, ARM’s proprietary RISC CPU core. They enable a complete range of CD / MP3 functions including various connectivity solutions as well as automotive solutions including CAN. TCC86xx is Digital Multimedia processor optimized for CD MP3 Applications including USB Host and MTP.